As I’m sure you know by now, I absolutely love sea glass and anything that is in a sea glass color scheme. Because I just finished up my Sea Glass & Cedar Mermaid Art, the watery hues of turquoise, aqua, teal, white and green have been on my mind. 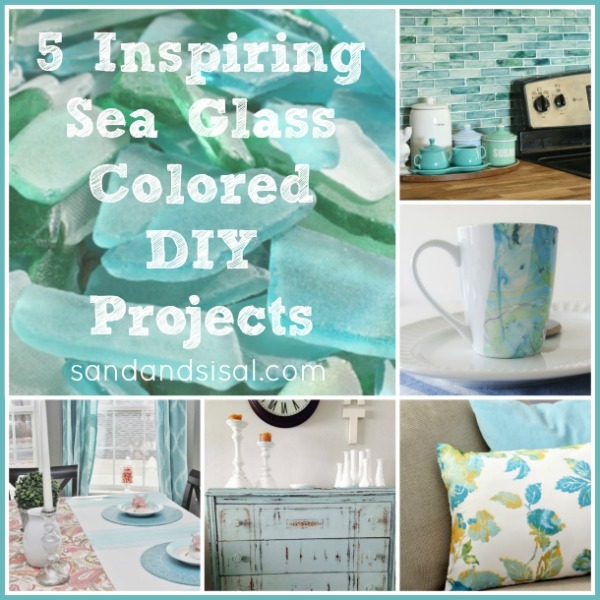 I’ve chosen 5 Inspiring Sea Glass Colored Projects to feature this week from the wonderful projects linked up to this week’s Inspire Me Monday link party. thank you so much, kim! you made my morning!!!! i saw you pin it yesterday and was just excited to see that, so this is even happier news! 🙂 have a fabulous easter weekend! Great post, Kim! Sea Glass is one of my favorite colors. Love your blog! Oh My Word! I didn’t even realize you featured my dresser! So excited! I’m a huge Fan of your blog! Thank you!